Developer Snapshot: "Frame Wiz is definitely A-MUST-HAVE application for anyone! 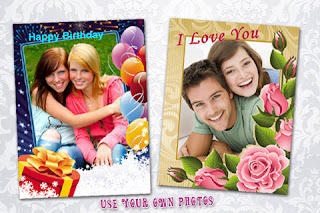 Use it to create beautiful photos, postcards & greeting cards for any occasion..."
On opening Frame Wiz, you may choose photos from your Photo Library, Camera or Contacts and decide if you want a plain white background or not. What impressed me, however, was the abundance of frames available under so many categories such as birthday, cool, love, emo, occasions, holidays, kids, music, etc. Simply slide the bar at the top of the screen to see the categories. Once you've selected one, then use the scroll arrow to see the variety of frames within that category. You may change photos, add text (using assorted colors and fonts), then save and share as you wish. The frames are really top quality and, of course, you can resize your photos within the frames. Why not send someone a memorable photo today that they will treasure? Use the easy and attractive Frame Wiz iPhone photography app to turn your simple photo into a beloved souvenir!